Both cars in the Wednesday afternoon wreck were totalled from the collision. Submitted photo. A fatal crash on Highway 37 a quarter of a mile north of Washburn claimed two lives in the early afternoon hours on Wednesday. According to the Missouri State Highway Patrol crash report, Frank W. Preston, 42, of Monett, and Dylan G. Davidson, 22, of Verona were both killed. Troopers responded to the two vehicle crash around 12:57 p.m. on Wednesday, January 27, where two vehicles were totalled on the highway. Davidson crossed the center line of the highway in a 1998 Chevrolet Tracker as he was headed southbound. He hit Preston’s 2011 Honda Accord headed northbound. 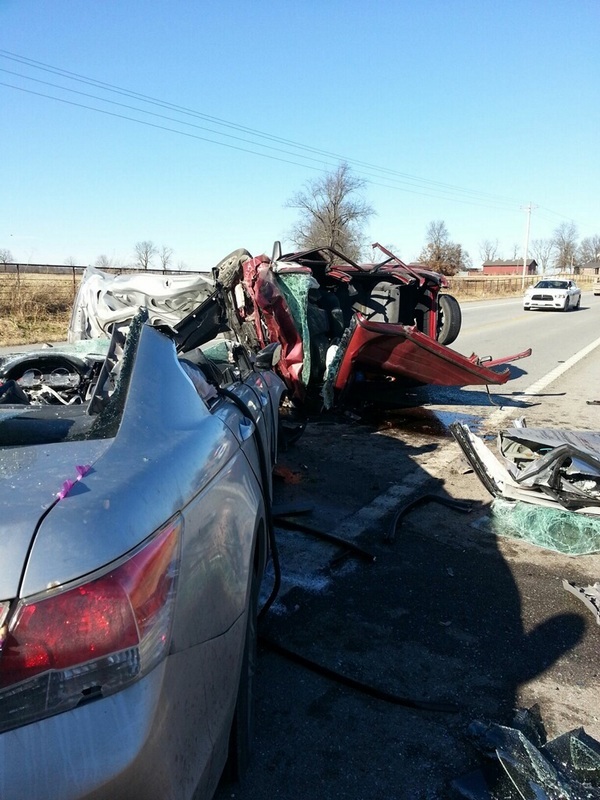 While both men were wearing seatbelts, both were killed as a result of the wreck. Barry County Deputy Coroner Charles McManus pronounced both men deceased at 2:05 p.m. Both bodies were taken to Fohn Funeral Home in Cassville. No other passengers were indicated as being present at the time of crash according to the report. The two vehicles were removed from the scene by Wilson’s Towing of Washburn. Both men’s next of kin were notified. These are Missouri State Highway Patrol’s ninth and tenth fatalities for 2016. Multiple crews responded to the crash to clean up the highway debris for other motorists. Submitted photo.